Greater sage-grouse are currently estimated to number from 142,000 to 500,000 individuals. 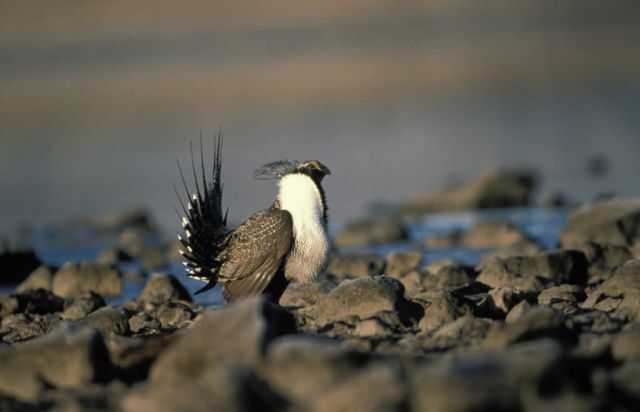 Sage-grouse populations declined an average of 3.5 percent per year from 1965 to 1985. Since 1986, however, populations in several states have increased or generally stabilized and the rate of decline from 1986 to 2003 slowed to 0.37 percent annually for the species across its entire range. Greater sage-grouse are currently found in Washington, Oregon, California, Nevada, Utah, Colorado, Idaho, Montana, North Dakota, South Dakota, and Wyoming. They are also found in small populations in the Canadian provinces of Alberta and Saskatchewan. The greater sage-grouse is a large, rounded-winged, ground-dwelling bird, up to 30 inches long and two feet tall, weighing from two to seven pounds. It has a long, pointed tail with legs feathered to the base of the toes. Females are a mottled brown, black, and white color. Males are larger and have a large white ruff around their neck and bright yellow air sacks on their breasts, which they inflate during their mating display. The birds are found at elevations ranging from 4,000 to over 9,000 feet and are highly dependent on sagebrush for cover and food.